This guide will help you generally identify what type of drive you're holding in your hand. IDE - This is NOT a SCSI drive. This is the more common IDE drive, generally found in intel/PC equipment (although they are worming their way into everything now-adays...), and now becoming more common on Macintosh and Sun Workstations as well. Ugh. Actually, to be fair, IDE has gotten better recently, and with enough caching, IDE drives now rival SCSI for speed - but their reliability is still an issue and they are much more difficult to RAID, but their comparative cheapness and ubiquity now makes them a serious factor for high-end solutions. Would I trust them for critical data? No, but they are dirt cheap, and decent enough for the average workstation -- and they come in enormous sizes now that allow you download movies and a zillion mp3's... IDE doesn't set ID's like SCSI, instead you're limited to a single master/slave combination (2 drives) per IDE controller. (Yes, that is my actual hand, not a stuntman or body double's…) The connector is 40 pin, arranged in two rows of 20 pins, while the jumper between the power connector and the IDE connector sets the drive to "Master", "Slave", or "Cable Select". 50 Pin SCSI - the "standard" SCSI drive that you're most likely to see if the drive is smaller than 18GB, and didn't come out of something requiring ultra-wide. If you're looking at a beige Macintosh, an earlier SUN, SGI, or other "high-end" workstation, then chances are you'll come across a 50pin SCSI drive in the 40Mb to 4GB range. If it's really an old machine with SCSI, yes, the drive might be a 5.25 full height device that sounds like a jet-engine when it spins up. 68 Pin SCSI - Most fast/wide drives are 68 Pin. Many external drive cases for later Sun systems and other high-end devices used 68-pin connections internally and externally. They can be adpated to 50 pin, but that adapter is cumbersome and doesn't allow the drive to be placed into a 3.5 inch drive bay because the adapter juts out from the rear of the drive. Believe it or not, this is the LEAST likely drive you're going to come across unless you're pulling apart an old server built around the time these became popular, because most fast/wide drives adapted to the next type of connector rapidly for advantages I'll detail below. 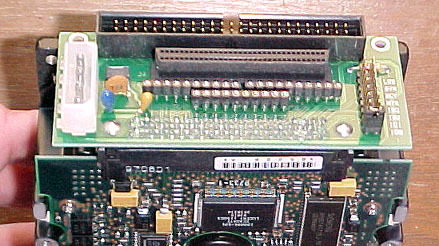 SCA - Power, SCSI ID, and the SCSI bus, all in one connector. SCA drives were created for RAID and "hot swap" situations where the drive gets everything via that single connection. Very nifty. SCA quickly replaced the 68-pin type drives in server situations because the drives could just be slid into and out the chassis of the server, and the moment the SCA plug hit the backplane of the server, the drive would get power, a scsi id and SCSI connection and be ready to use. Adapters exist to allow the SCA connector to be "broken out" into a 50 or 68 pin (or both), power and SCSI ID. This adapter consists of a small board that sits against the entire rear of the drive and goes vertical. Again, with the adapter in place, you'll find it difficult to get the drive into a tight drive bay -- but where there's a saw, there's a way. For a picture of these adapters, see the bottom of this page. DB-25 connector - This is important, as SCSI is identified by this symbol (usually)... It's important to look at this, because many parallel ports on PCs feature a similar looking DB-25 connector, and this is not to be confused with SCSI! The pinouts and voltages are different and damage to your external SCSI device, your computer or both could result if you plug the SCSI device into your PC's printer port! SCSI cables communicate between a SCSI port and a SCSI device, or between two SCSI devices. SCSI (Small Computer Systems Interface) is standard on most beige Macintoshes and optional on PCs, but is also generally found on workstations and servers. SCSI is advantageous over other types of controllers/devices because of its high speed data rate and its ability to support up to seven devices (eight devices including the controller itself). Hard drives, tape drives, optical drives, scanners, and CD-ROM drives can all use the SCSI interface. SCSI uses IDs to specify the device, which are numbered from 0-7. Most SCSI host adapters have to be set to SCSI ID 7 (or zero). Most external SCSI devices use a Centronics 50 or male DB-25 connectors, or HD-50 connectors. Generally speaking, the controller should be set at ID number 7. The higher the setting, the higher the priority (HOWEVER, SCSI id's are usually checked in numerical order at startup, so a boot drive should be set to zero (or 1)(if possible)). Slower drives should be set with a higher ID so they can access the bus whenever they need to. Each device has to have a unique ID. In general, the bootable hard drive is set to an ID of 0 and the CD-ROM to an ID of 6 or 3 (depending upon the machine -- SUN machines prefer 6, while Macs prefer 3). This is not a requirement, just a suggestion, as sometimes the ROM/PROM will have a shortcut to the CDROM if it assumes the proper SCSI ID. These things can be found, but a warning -- they ain't cheap, and generally nullify any monetary savings to be had by scavenging an SCA drive from a junked server. If you've got some already, then you're set. The best way to get one is to beg one out of a freind that has some already, because believe me, you don't want to pay for this thing when hard drives are now so incredibly inexpensive. 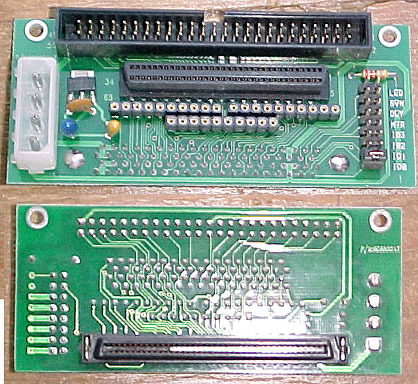 The particular unit shown here breaks it out into either 68 pin or 50 pin, but there are cheaper versions that only break it out into a single connector (usually 50 pin). Again, if space is tight where you're mounting the drive (such as a lunchbox style chassis), the extra room taken up by the adapter means that you won't have an easy time fitting the drive (unless you're willing to do some serious case modification). Generally, you're going to find three jumpers on a SCSI drive, they are often labeled A0, A1, A2. These jumpers control what SCSI ID the drive is set to (this obviously won't work on SCA drives, unless you have the SCA Adapter with it's own jumpers). SCSI Wide drives, which often allow up to 15 devices, have a 4th jumper, which follows the same pattern. It would help if you already knew how to count in binary, because this is exactly how it works! So the moral of this story is know your binary!!! A good tip to know is to check the website of the drive manufacturer. Usually, they will have pinouts of the drive, and all you need to do is to type in the drive model number (such as ST12450) and there's just about everything you ever needed to know about that drive. Isn't the web wonderful? If you can't find the drive manufactuer (or it's been rebranded by another reselller such as HP or Apple), trying doing a search for the drive on Google (the best search engine out there), and see if that generates a lead as to the actual manufacturer and model number.